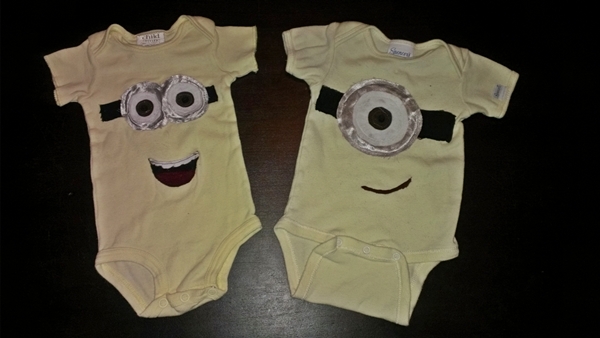 If you wouldn’t mind I’d love to have instructions on making these onsies for my grandson that will be here in October. Thanks in advance!!! Hi Anita, These were so fun to make. 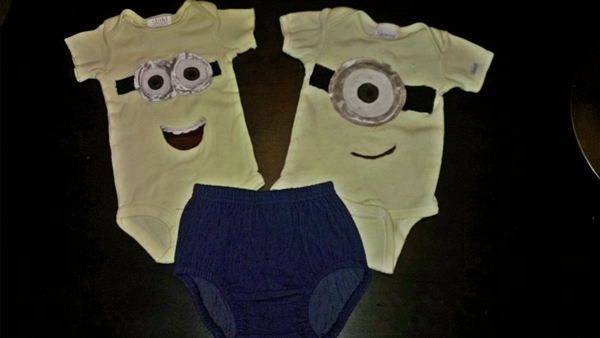 Finding solid, plain yellow onesies wasn’t easy though. I ended up finding some at a garage sale and on ebay. I bought all the different colors of fabrics for the goggles, eyes and mouth and then used a pencil to draw the shapes I needed and cut them out. Then used a lil fabric glue to hold them in place with each other. I sewed along the edges of each layer. I did this after I had glued it all onto the onesie, but in hindsight, I should have sewed all the goggle pieces together BEFORE sewing the whole piece to the onesie. Probably would have been easier. The little denim bottoms I got at hobby lobby. Hope that helps out! Hi! Just wondering.. What fabric did you use for the goggles? Hi Hazel! I used a silver, satin like material I found at Hobby Lobby for the goggles. The shiny-ness of the material made them look more like goggles I thought.